Zynga's absorbed a lot of companies in the last two years, but few experienced the sudden shift in fortunes that OMGPOP did over the last few days. Within two months, the studio saw their Draw Something become a breakout hit, which lead their getting snapped up by the social game giant. A recent New York Times article chronicled how the influx of cash means happy times for OMGPOP staffers, with company co-founder Chares Forman saying that he went from having $1700 in his bank account one day to a whole lot more than that the next. But Shay Pierce turned his back on all of that. Pierce worked at OMGPOP but also made an indie puzzle game called Connectrode on his own time. 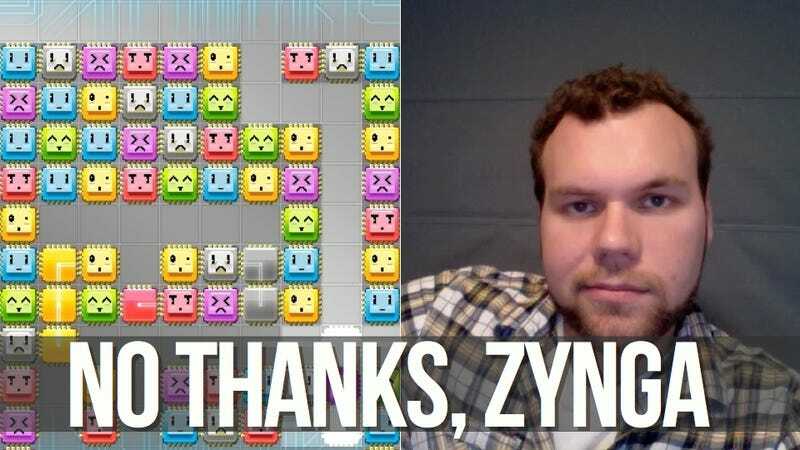 After it became clear that he'd have to choose between ownership of his game and a steady paycheck, Pierce chose to opt out of full-time employment with Zynga because of what it'd mean for his rights to Connectrode. In a piece at Gamasutra, the developer talks about how Zynga's values didn't sync up with his and that the idea of giving up ownership of a game that he made with his own sweat made him pass up the promise of security. It's not easy to pass up a lucrative salary and solid benefits, of course. But I realized that ultimately I was letting myself be guided by simple inertia. I was part of a herd, and that herd was all going in one direction (and doing so with great urgency). I would really only be doing it for the sake of going with the flow, and responding to pressure to either conform to corporate expectations, or be left behind. Pierce lays out exactly what it is about Zynga's practices that he disagrees with, saying that organizations like the Farmville company views players as weak-minded cash cows and developers as replaceable tools. The whole thing's worth a read and if you respect Pierce's walk-away-from-evil stance, then buy Connectrode on the App Store.